Here is the most recent North Carolina Education Lottery spot that I cut and graded. Great directing and talented actors made this spot a joy to work on. Shot on Arri Alexa, edited in FCPX and graded in DaVinci Resolve 10. A short film I edited and graded will be premiering very soon. Check out the trailer – cut by the director, Shea Sizemore, with an original song he co-wrote for the film. I love it. I love the film. I hope you will too. I’ll keep you posted. This is piece that I shot and edited for www.askdrmatthew.com. Instead of a straightforward approach to the edit where each person tells their story in a linear fashion or as separate testimonials, I chose an approach that interweaves multiple patient testimonials to evoke an overall positive feeling toward the work that Dr. Matthew McAlees and his team at the Charlotte Health Center do for people in ways that traditional medicine usually cannot achieve. It clocks in at over 8 minutes, which is longer than I would typically like to hit, but I feel it holds the viewer’s interest and the range of issues are likely to hit a personal area for the viewer. Well worth the read. These are three fine choices and picking one is now a simple matter of preference. I think we all know my preference by now. The editing world includes a number of software options, such as Autodesk Smoke, Grass Valley EDIUS, Lightworks, Media 100, Sony Vegas and Quantel. 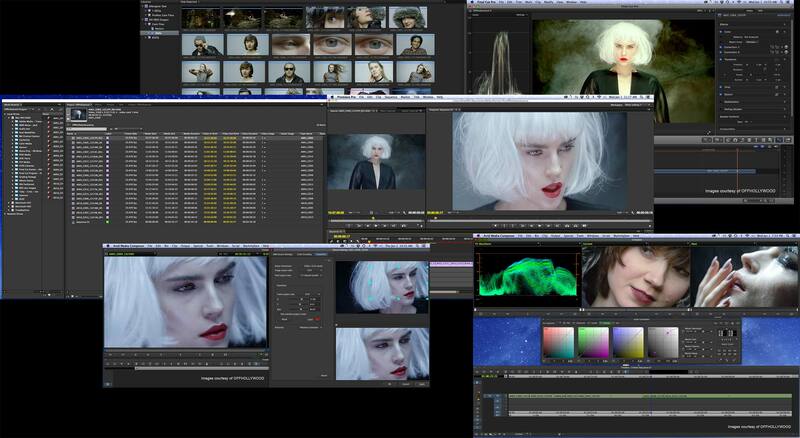 The lion’s share of editing is done on three platforms: Apple Final Cut Pro, Avid Media Composer or Adobe Premiere Pro. For the last two years many users have been holding onto legacy systems, wondering when the dust would settle and which editing tool would become dominant again. By the end of 2013, these three companies released significant updates that give users a good idea of their future direction and has many zeroing in on a selection. I’m logging nearly 4 hours of interviews and here is my workflow. Once my interviews are synced and organized in the browser, I choose to string them out in a Project rather than logging in the browser. I like being able to zoom in and out more precisely and trim out the ‘fluff’ as I go. In this project I have a 2 camera multicam clip set up as well, but I do this even on single camera interviews. I usually play the interview at double speed, slowing down for key portions. I really like the fast scrubbing in FCPX. I think it is the most clearly understandable of the other NLEs I’ve used (AVID, Premiere and FCP7), even when music is added to the mix. When I hit a key word or a laugh or something worth marking, I create a marker (m key) then hit m again and write a note of what they said. I go through the whole set of interviews then build a great timeline index for quickly searching words or phrases. The big standout bites, I’ll mark with an asterix * then easily filter the timeline index in the search field. The timeline index will scroll along as I’m playing back and also allows me to jump to the point I’ve marked by simply clicking on a marker in the index. Once logging the A-Roll is complete, I duplicate the Project, rename it, and whittle away at the edit. Markers stick around on soundbites I use and I have my logging Project to refer to as my source. I know this is nothing ground-breaking. It’s probably what a lot of people do, but it is very effective for me in crafting the A-Roll of unscripted projects. It is perfect when working with a producer and we’re hunting for a particular quote or topic. 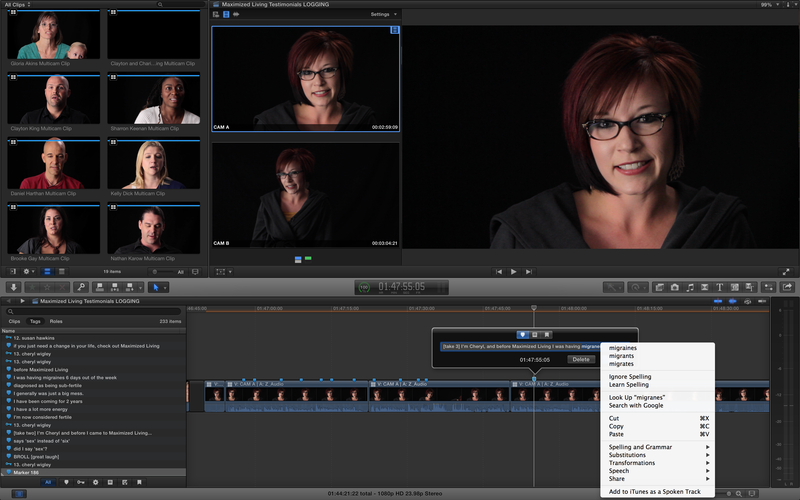 One other cool function of FCPX is its built-in integration with the OSX dictionary. Right-click on any word and you can check spelling, look up definitions and even check a thesaurus. P.S. – I do know how to spell ‘migraine’, I intentionally misspelled it for the screen grab. I would love to see Apple add some more advanced features in the timeline index such as speech recognition and script import/syncing. It’s not a big stretch of the imagination to see it fitting very nicely in the current layout. Everything we take for granted in personal computers today was first demonstrated by Steve Jobs on January 24, 1984. The Macintosh turns 30 on Friday. I first met the Macintosh in 1989 at my friend Michael Ryan‘s house. I had messed around with the TRS-80, the Apple II, the Commodore64, the ti-99/4a, but this particular little box awoke a wonder and fascination in me that perfectly balanced the “intersection of technology and liberal arts“. The Macintosh is infused with that ethos. The creative possibilities of music creation, graphic design and desktop publishing seemed endless to me, and I set out to learn as much as I could about design, MIDI, programming, music and technology. That pursuit eventually led me to video editing. The craft of storytelling using a Macintosh has been my career for the past 20 years and it is because of visionaries such as Steve Jobs that it’s been technologically possible for people to pursue their creative dreams with very little investment or corporate servitude.